A police officer claims that not only were the employees of a Rhode Island Dunkin’ Donuts rude to him when he ordered a coffee Oct. 2, 2015, but they also wrote “black lives matter” on the side of his cup. 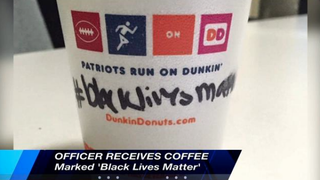 A Providence, R.I., police officer went into a local Dunkin' Donuts Friday looking for a hot cup of coffee, but he claims he was given a hot cup of attitude and a social-justice hashtag on the side of his cup. According to ABC 6, the officer, who didn't want to be named, says he was afraid to drink the coffee he'd received from Dunkin' Donuts after an employee was rude to him and reportedly wrote "black lives matter" on his coffee cup. "Posting stuff like this against our officers is unacceptable," Providence Fraternal Order of Police Lodge President Taft Manzotti told the news station. Manzotti opined that the Black Lives Matter movement "condones violence against police" and said the union believes "all lives matter." "When we get a call for service, we don't ask if the person is black or white, if they're Asian or Spanish," another member, Clarence Gough, told ABC 6. "We do the best we can for the public at large. That is our commitment to the city. And the country." This isn't the first time an officer has been met with resistance while trying to buy a cup of coffee from Dunkin' Donuts. According to the Daily Mail, a West Hartford, Conn., employee reportedly told an officer that the store "doesn't serve cops." When the officer looked puzzled, another employee reportedly added, "He didn't get the message. We don't serve cops here." "The two separate and isolated incidents involving Dunkin' Donuts employees in Providence and West Hartford are not consistent with our commitment to provide outstanding guest service," Michelle King, senior director of global public relations at Dunkin' Brands, told the Daily Mail. "Dunkin' Donuts and our franchisees share a commitment to the well-being and fair treatment of all our guests. The franchisee in both cases have apologized on behalf of their employees to the police and very much regret the situations," she said, according to the Daily Mail. Read more at ABC 6 and the Daily Mail.